Hey Perthians- Im looking for reports/feedback on how the B8 Volvo Optimus artic is performing over there. Im wanting more to hear from those driving them or fixing them if possible. Awesome to drive. Quick and quiet. Apparently some drivers still feel some unwanted movement from the rear in the wet. From a passenger's perspective, the Volvo B8RLEA provides a wonderfully smooth ride. Despite the smaller engine, they perform just as well, if not better than the B12BLEA product that they replace, even at low engine RPM. They are definitely not lacking in any way when it comes to standing-start performance, even on sidehill starts with a load of passengers. Technical downsides? Well, due to the short diff ratio, they max out at barely above 90km/h at the top of the rev range with the twin-overdrive ZF EcoLife gearbox which is acceptable for a city bus but probably not really great for outer suburban or long distance services. The downsized engine (Volvo D8K350) is much more rev-happy than the previous engine used on articulated buses (Volvo DH12E340) but the factory gearbox programming doesn't take advantage of that. In the Perth examples, this has been addressed pre-delivery. In relation to the bodywork, if you have experienced the Volgren 'Optimus' product, you would know what to expect. *I should mention also that the new Volvo D8K engine is very significantly quieter and produces much less vibrations across the entire rev range than the previous Volvo DH12E product. You can barely hear the engine running from the front of the articulated bus. PoweredByCNG wrote: From a passenger's perspective, the Volvo B8RLEA provides a wonderfully smooth ride. Despite the smaller engine, they perform just as well, if not better than the B12BLEA product that they replace, even at low engine RPM. They are definitely not lacking in any way when it comes to standing-start performance, even on sidehill starts with a load of passengers. they don't max out at 90kph they are speed limited to 90kph. The takeoff from 1st gear to 2nd gear for the B8RLEA is much zippier compared to the B12BLEA as the ratio for the Voith is very high. MrBus wrote: they don't max out at 90kph they are speed limited to 90kph. Hence why I said "barely above". 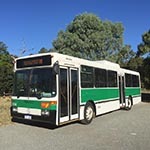 I got to experience one on the Freeway from Hodges Drive, Heathridge to Leach Highway, Bateman in the very early days and at the said limited speed of 90km/h, it was operating at a point where you really wouldn't want to push it any harder for extended periods of time. They are a city bus and realistically speaking, higher road speeds are really not necessary in today's Perth. I loved driving them. The B8 rigid CAT buses are just as nice. Thats why most of the TransWA long distance coaches use manual transmissions still I guess..
Having said that, I can't believe Dual Clutch or IVT / Continuously Variable transmissions haven't caught on in truck / bus markets yet. I had a go at driving a John Deere tractor with a ZF IVT transmission about a year ago and it was an eye-opening experience. I know it wouldn't be that handy in a road situation, but it had a lever for low or high range, and near the top of the lever - there was a thumbwheel and you could adjust it up or down and there was a LED ring around the edge of the speedometer. And you could, for example, adjust it to 42 Kp/h and it would get up to that speed quickly and hold it precisely for as long as you wanted - perfect for planting seed at say 8 Kp/h, and as soon as you touched the accelerator pedal it would drop out of that speed and start acting like a normal automatic again. But the acceleration band driving it 'normally' even was so much more rapid and seamless than a normal automatic that I'm surprised that very few of these have migrated to the road market applications yet. When they develop a dual clutch that can put up with the torque output of a diesel, that will be the death knell of the conventional transmission in trucks and buses in my opinion.